"This vegan stew is absolutely excellent. A spicy hearty dish that is sure to make everyone smile. Top with chopped cilantro, if desired." Place the potatoes, carrots, and celery in a pot with enough lightly salted water to cover, and bring to a boil. Cook about 10 minutes, until slightly tender. Drain, and set aside. Place the 4 1/2 cups water and vegetable bouillon cubes in a pot. Bring to a boil, and cook until bouillon cubes have dissolved. Remove from heat, and set aside. Heat the olive oil in a large pot. Saute the onion and garlic until tender. Season with chili powder, cumin, and seasoned salt. Mix in the potatoes, carrots, and celery. Cook and stir about 2 minutes, until heated through. 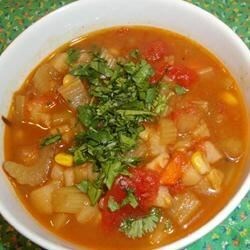 Mix in the water and dissolved bouillon cube mixture, hominy, and diced tomatoes with green chiles. Bring to a boil, reduce heat, and simmer 45 minutes. Season with salt and pepper to taste. Super easy & tasty chops! 1 pot method: saute onions/garlic/spices. Then add potatoes/carrots/celery/water/boullion. Then the rest. We make this at work and get requests for the recipe everytime we serve it. We follow the directions exactly, but I like the idea of adding pinto beans to give it some good protein.